Hans Christian Andersen’s biography shows that he didn’t have a very charmed beginning, however, the storyteller rose from poverty to create a world of literature that has charmed nations. Hans Christian Andersen. Photograph by Thora Hallager, 1869. 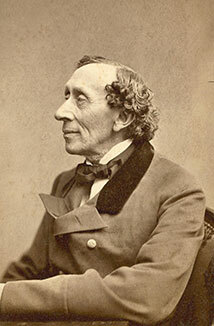 Born in 1805 in Odense, Denmark, Hans Christian Andersen was the child of a shoemaker and washerwoman. He lost his father at age 11, and his father made the biggest impression on him at a young age, as young Hans Christian was regaled with tales from A 1001 Nights. He was also told tales by elderly women at the Odense Hospital. He wanted to be famous and perform, so in 1819, at age 14, he went to the Royal Theater in hopes of becoming an actor. As he traveled to the theater, he told his mother, “I’ll become famous! First you suffer cruelly, and then you become famous.” He tried unsuccessfully to meet his goal, but failed. However, his fate would soon change. One of the theater’s directors funded his education after seeing his talent for stories and realizing he needed to go to school. Hans Christian Andersen finished his schooling with a private tutor after experiencing bullying, then went to Copenhagen University. Scholars note that it’s this experience, going from a life of poverty to attending school with the rich elite, that inspired The Little Mermaid story, which features the mermaid moving from one world to another. The Ugly Duckling. Illustration by Vilhelm Pedersen, published in New Fairy Tales, First Collection (1844). During and after going to school, he was extremely prolific, turning out poems, tales and more. In 1835, he published his first novel,The Improvisatore, and the same year, the first collection of Hans Christian Andersen fairy tales was published. The collections were released in 1835 and 1837, and were known as Fairy Tales Told for Children, but later renamed to New Fairy Tales and Stories. He passed away in 1875 in Cophenhagen, Denmark. In honor of his legacy, a tribute, Hans Christian Andersen statue featuring his Little Mermaid was erected in 1913. Another statue depicting the author is in New York City’s Central Park. Andersen’s fairy tales have been translated into more than 125 languages, and have become culturally embedded in the West’s collective consciousness. Two of the most known works for Hans Christian Andersen, the Snow Queen and The Little Mermaid, have been retold for hundreds of years in various forms. Readers of these Hans Christian Andersen stories will quickly find that the original stories are starkly different yet just as enjoyable. 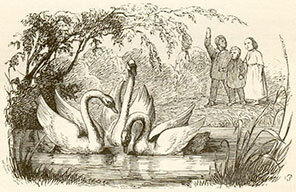 Other famous stories by Andersen include The Princess and the Pea and The Ugly Duckling. 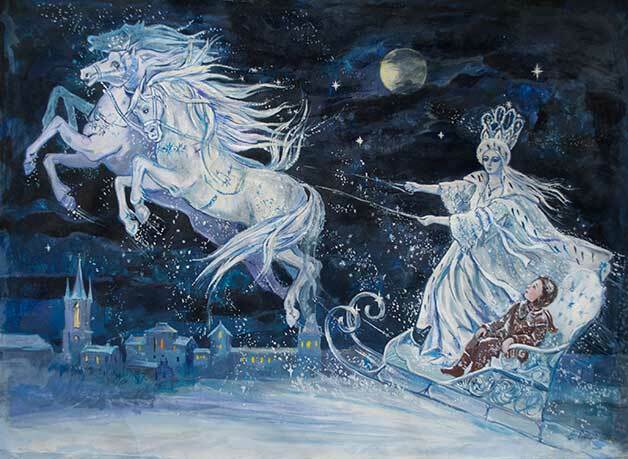 Hans Christian Andersen’s The Snow Queen. Illustration by Elena Ringo, published in New Fairy Tales, Second Collection (1845).